With the smallest footprint available, the DL2 Narrow Profile (NP) is 10" narrower than the DL2 rack, and is ideal for small transit vehicles and when minimal headlight and turn signal interference is required. This all steel design carries up to two bikes, and accommodates wheel sizes from 20" to 29" and up to a 44" wheel base. The DL2 NP is available in stainless or mild steel, and comes in a variety of colors/finishes. The DL2 NP's unique No Scratch™ support arm secures the front tire without straps or cords and prevents damage to bicycles. This translates into simple and intuitive passenger use, and quick loading and unloading times to keep bus on schedule. With a minimal lifting weight of 19 lbs, the DL2 NP is lightweight, easy to use, and falls well below OSHA and NIOSH limits. The narrow profile (NP) pivot plate measures 16 7/8” wide, and provides the mounting and pivot point exclusively for Sportworks DL2 NP bike rack. The pivot plate is connected to bumper brackets, and enables the bike rack to move between the stowed and deployed positions. The new Apex 3™ bike rack sounds like a very compact layout. Is it safe to use on smaller transit vehicles like cutaways and paratransit vehicles? Measuring 82” wide, the new Apex 3™ offers the most compact, maneuverable, and unobstructed layout of any 3-position bike rack available today. One of the key design objectives was to create a highly-compact footprint that provides minimal impact on vehicle turn-radius and headlight/turn signal interference. Sportworks recommends using the Apex 3™ on any transit vehicles measuring at least 96” wide (excluding mirrors). Online vehicle data suggests that most cutaways measure 96” in width. For more information about the width of your vehicles, please contact the OEM vehicle manufacturer or reseller directly. 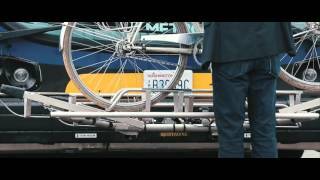 Are transit racks easy to usen and are there problems with bike theft? Our racks are designed to carry an average size bicycle. We recommend bicycles with no longer than a 44 inch wheel base, 2.3 inch wide tires, wheel diameters of 20 inches or larger and a total weight of 55 pounds or less per bike. However, in many cases we have heard that some agencies stray from this recommendation in order accommodate the needs of their passengers. The rack was not designed to be used with motorized vehicles such as motor scooters, which generally fall outside of the carrying capacity. Coming in early 2006 we will be releasing the VeloPorter 2, this product will accept tires up to 3 inches in width, 16 to 29 inches in diameter and increases the wheel base to 46 inches. NOTE: Installation and use of bike racks on the rear of vehicles is not recommented, and may void the manufactuers warranty. For additional information about “Warranty Exclusions” please see Sportworks Limited Warranty. How long does it take to load and unload bicycles? One can load or unload the bicycle from our rack in less than 10 seconds. Some tests have proven an average load/unload time to be approximately 7 seconds. The best way to overcome this barrier is to set up a demonstration and let people try it without any instruction. Nay-sayers will be surprised!